As a resident of the Midwest, I have come to appreciate the seasons and seeing what was once dead or bare, come to life during the spring and summer. With some hesitancy, small financial investment (this means a lot for a graduate student! ), and a little courage, I decided to garden this summer by planting my own seeds. I wouldn’t say I have a green thumb, but the thought of making fresh vegetables and flowers from a couple of seeds, dirt, and water intrigued me. My first experiment was with an early planting of carrots. I was happy but still a bit disappointed to see only nine of the thirty pods growing. A little bummed about the carrots, I didn’t feel very excited about planting the green bean and sunflower seeds I still had. After a bit of self-coaxing I finally got around to planting the rest of the seeds. If anything helps you to feel a bit closer to nature, it is definitely working with potting soil and seeds. Even though I bought the seeds and potting soil at a store, there is something that makes me feel pretty raw when working with these materials. I filled all the planters with soil, planted the seeds, placed them on a large tray, watered them with care, and then hoped and waited. My not-so-hard work started to show only a few days later, when I began to see the first signs of seedlings, a little green stem starting to push out of the dirt. I have to say I was pretty thrilled, seeing the beginnings of new life on my front porch. During my daily activities, I would pass by the tray with my planters on a pretty frequent basis. It was during one of my outings out of the house, passing by my beloved seedlings, that I began to think of the beauty of life. 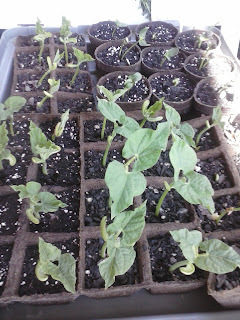 All I did was plant a few seeds, and in return small but thriving green bean plants and sunflowers were starting to grow. It seems so simple, but the power in making a living thing out of dirt, a seed, water, and sun, seems pretty amazing when you meditate on it. As a pro-life, grassroots activist, I often have the holocaust of the pre-born on my mind, and what could possibly turn our whole nation around to defending the rights of the pre-born. The remarkable occurrence of life is the same with the pre-born; through the sexual act, simple parts have come together to make a new human being. I began to meditate how if I was in such amazement at the creation of a few simple plants, how much more amazing the creation of a new human life in its mother’s womb. Over the last few years, I have become a fan of Dr. Scott Klusendorf, the president of the Pro-Life Training Institute. I remember in one of his talks he explained (or re-explained; I zoned out a lot in my high school science classes) the Law of Biogenesis. The law simply states that living things make after their own kind, meaning my green bean seeds cannot make watermelons, or a cow cannot (crazy science experiments aside) birth a pig. The same can so easily be said of the pre-born. They are human at the moment of conception, and all they need is time to grow. I feel that if our societies and nation were also in awe of life in the human womb, then we wouldn’t have such a huge issue with so many accepting and having abortions. As a young woman, I can say that I would be delighted to get married and to experience the awesome miracle of life inside myself through pregnancy. It seems that we need to take into account that we are dealing with what may seem simple, but very powerful forces. We are indeed dealing with the profound notion of life, and its cousin, death. Whatever our belief systems may be, meditating on this miracle of something coming from practically nothing is enough to keep us pondering for eternity. I think our response needs to be a humble amazement at the beauty that is life, and doing our best to protect it in all circumstances. Couldn't agree with you more. Yet this piece somehow makes me visualize those who value complete sexual freedom more than that miraculous life as covering their ears and shouting "La-la-la-la-la-la-la...!" when we speak of such things. This is a wonderful reflection nonetheless!